Frontline units of the Pakistani navy have been equipped with C-602 anti-ship cruise missiles purchased from China, according to the Kanwa Defense Review published by Andrei Chang, also known as Pinkov, a Canadian a military analyst. 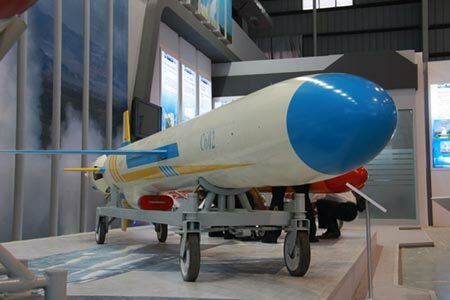 Pakistan ordered about 120 C-602 anti-ship cruise missiles from China back in 2009. The first batch of the missiles, enough to equip a company, were delivered in 2011. After personnel completed training on using the missiles, the Pakistani government said that the C-602s have already been deployed to frontline naval units. The missiles were purchased to provide a countermeasure to India’s BrahMos supersonic cruise missile, which has a range of 290 kilometers. The anti-ship cruise missiles have an estimated range of 280 km with a speed of 0.8 mach. As Islamabad is discussing allowing the military to employ the civilian version of China’s Beidou Navigation System for use on the battlefield, Kanwa Defense Review said that the accuracy of the C-602 can be increased gradually if a deal is made between the two countries. Pakistan is currently the only foreign operator of the C-602. This SSGK will better than indian navy's "SSBN"
Why should Pakistan go for SSKs? ''Designed to enhance the performance of modern conventional (diesel-electric) submarines AIP is a key emerging technology that essentially provides a “closed cycle” operation through a low-power electrical source supplementing the battery, which may extend the submarine’s underwater endurance up to two weeks or more. AIP systems close the endurance gap between nuclear and conventional submarines, and mitigate increasing risks of detection caused by advanced anti-submarine warfare technologies - from modern electro-optical systems and surface radars to magnetic sensors, active and passive sonars, and airborne surveillance radars. Advanced AIP technologies thus promise significant operational advantages and tactical flexibility. (=nuclear driven subs) were participating . . . ."
From: " The Changing Role of NATO submarines", Naval Forces 5/89, vol X." by Norman Polmar. Cost of typical AIP sub is 100 million USD to 250 million USD, compared to 1,6 – 3 billion USD for typical nuclear submarine; . As Capt. Tom Abernethy, who commands the sub-hunting Destroyer Squadron 22 based in Norfolk , Va. , said: “Shallow water, you get a lot of noise reverberation and additional traffic, and you’re fighting in somebody else’s back yard which they know pretty well …. [In that environment, even a diesel sub] is absolutely a real threat, a formidable threat …. ”. Furthermore, unlike nuclear submarine, diesel submarine can hide on the floor, completely silent and immobile, until something passes nearby. And even with usage of active sonar, it is not easy to discern submarine from its surroundings. Submarine Trends in Asia Pacific: Air-Independent Propulsion A Game Changer?